ALL the Upgrades you have been searching for are HERE! MUST SEE - STUNNING Move-In-Ready Home in Pavilion - Riverview's most sought after community. *Updated Kitchen* *A/C 2015* *3 Car Garage* *Beautiful Laminate Floors* *HUGE Screened Lanai* *Updated Counters throughout* *Fenced Backyard* Welcome to your New Home Sweet Home! You will fall in love with the Bright and Open Layout of the Monterey floor plan. 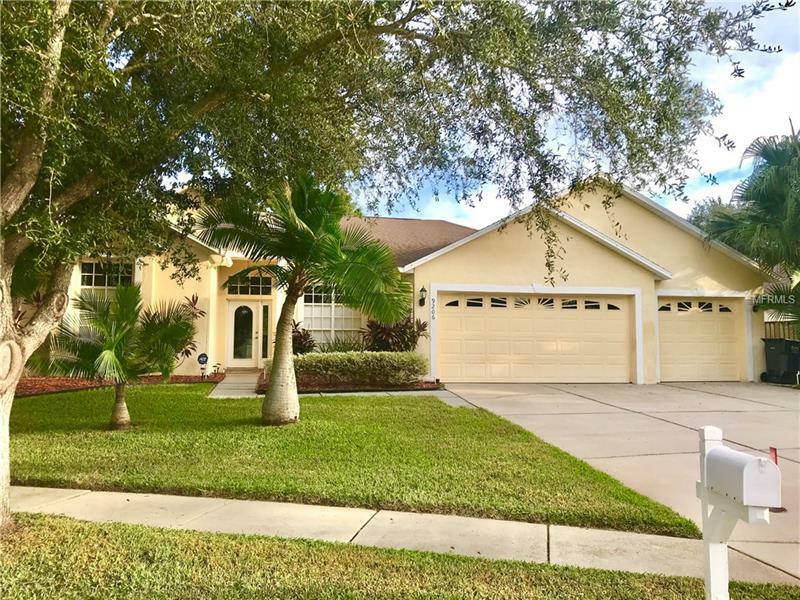 Formal Living Room, Formal Dining Room, Spacious Family Room, Kitchen with Granite Counters, Custom Tile Backsplash, Breakfast Bar, Stainless Appliances and Sunny Eating Area. Master Suite features a Large Bedroom with slider to the Screened Lanai, 2 Walk-in Closets, and Master Bath with Double Vanities, Walk-in Shower and Relaxing Garden Tub. 3 more Generously-Sized Secondary Bedrooms and 2 Full Baths. 3 way bedroom split layout - great for a Guest Room. ENJOY the Florida Sunshine with this great outdoor space!! Step out to your large Screened Lanai - the perfect spot for morning coffee and the Fully Fenced Backyard is a great place to entertain family and friends! PLUS THREE car garage for extra parking and storage space. Pavilion community has so much to offer including a Community Clubhouse, Resort Style Pool, Fitness Center, Tennis Courts, Park, Playgrounds and a Calendar Full of Fun Events! ALL with a Great Riverview Location close to Schools, Shopping, Dining and Entertainment! You don't want to miss this one, Come check it out Today! Pet Restrictions: Buyer to check with HOA for pet restrictions.